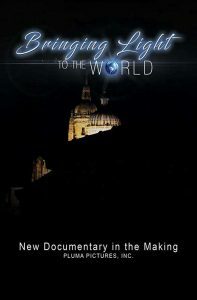 A new documentary, entitled Bringing Light to the World, about the two historic Dominican congresses–one held in Rome earlier this year and the other in Salamanca in 2016–has been launched by an award-winning Dominican filmmaker. “Dominicans have been ministering to the poor, the forgotten for centuries,” said Armando P. Ibáñez, O.P., friar of the Southern Dominican Province. Dominicans have a long history of working with and for the poor, equality and peace, dating back to friars Bartolome de las Casas, Antonio de Montesinos, Francisco de Vitoria and other luminaries who struggled against the enslavement and brutal treatment of the Indians by Spanish conquistadores. Today, in addition to working with the very poor, Dominicans also work with victims in war-torn areas, for equality and peace in many parts of the world, while others work for peace in diplomatic circles. “And many Dominican artists and intellectuals consistently have stood for human rights,” added Ibáñez, whose latest documentary, South Texas Gentle Men of Steel – Los Padres won 17 international film awards. His first feature documentary, Not Broken, about the Katrina disaster, was screened at international film festivals and also won a number of awards, including a Platinum Remi Award, the top award in the category Independent Film & Video – Documentary at WorldFest Houston in 2008. Pluma Pictures, Inc., a non-profit film production company, is producing the documentary. The two historic congresses of Dominican friars, sisters and laity, were held in commemoration of the Order’s 800th anniversary. In Salamanca, about 200 Dominicans from many parts of world, including Africa, North, Central, and South America, Europe, Australia and Asia, prayed, discussed and drafted a position paper about peace and justice. In Rome, more than 600 Dominicans reflected and reaffirmed the Order’s primary mission of preaching in a world gripped in the harsh realities and challenges of today. Bringing Light to the World will include interviews with the Master of the Order, Bruno Cadore, O.P, former Master of the Order, Timothy Radcliffe, O.P., Dominican delegate to the United Nations, Mike Deeb, O.P., and a number of other Dominicans who were involved in the congresses at some level. “My aim is to produce a documentary that is engaging, creative and artistic as it reflects on the significance of the two congresses in light of the Order’s life-giving mission of preaching the Word,” said Ibáñez. Prayer is most important, he said, adding that he is asking Dominicans to join him in praying for wisdom and the success of the film. Another important way to help in the production of the film is to provide photos and/or video of Dominicans in ministry. (Please no posed photos. Action shots are needed.) Interested persons are asked to email pluma@earthlink.net for submission guidelines. Contributors will be cited in the credit roll of the documentary. The board of directors of Pluma Pictures are: Bruce Schultz, O.P., Southern Province; Christopher Renz, O.P., Western Province; Thomas Hedberg, Ph.D., Erlinda Estaquio-Grey, M.D., Ned Greene, all of Los Angeles; James Moses, M.D., and Michael Paz, both of New Orleans. Armando P. Ibáñez, O.P. – is an award-winning filmmaker, writer, poet and professor. He serves as Director of the Radio-Television-Film (RTF) and Assistant Professor at Texas A&M University-Kingsville. His latest documentary, entitled South Texas Gentle Men of Steel – Los Padres, won a total of 11 international film awards, including the Platinum Award from the Oregon International Film Awards and an Award of Excellence from IndieFest Film Awards. Also, he is listed in the Dictionary of Literary Biography. Todd Schmidt – is an award winning filmmaker, editor, VFX artist and photographer. Schmidt, who specializes in visual effects and 3D animation, is co-producer of South Texas Gentle Men of Steel – Los Padres. His awards include: Gold Award, Animated Visuals in South Texas Gentle Men of Steel – Los Padres, International Independent Film Awards; and Best Graphics in the New Orleans 48 Hour Film Project. Joe O. Barrera – is a music composer for film, television, and the concert hall. Barrera has composed music for over 40 television productions, independent films, and documentaries. His honors include: 2 Emmy Nominations, Certificate of Achievement Award in music from Billboard Magazine, and 7-time ASCAP Award winner for his music in television productions. Joe has been listed in The Hollywood Reporter’s ”Who’s Who in Composing” (Film & Television Special Music Issue).